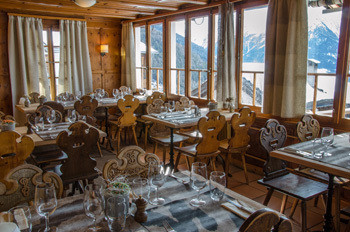 The warm atmosphere of the restaurant radiates through white-lattice windows; Swiss pine woodwork and chairs carved with local families’ coats of arms seem to be dancing in the candlelight. In the bistro, our own aperitifs and a selection of vintage wines by the glass are served in a relaxed décor. The intimate ambience beckons you to come in and warm up at the ‘après-ski’ hour. Old-fashioned hot chocolate and blueberry tart shared with friends and family will leave glowing memories of your stay at the Chalet Favre! Our Chef, Thierry Verdonck, will surprise you with an unusual menu focusing on fresh regional products. Please ask for our daily suggestions and menus! Among the musts why not taste the escalope cordon bleu maison and typical blueberry tart! And don’t miss our delicious valley cheese raclette, served with love every Monday! 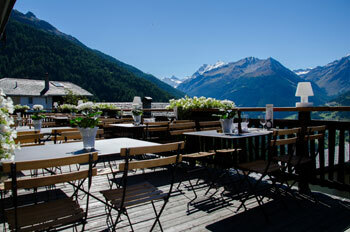 Facing the snowy peaks of the Val d’Anniviers, the extensive timber terrace looks out over the valley with breathtaking views of neighbouring villages dotted like a necklace across the slopes! During the low season the restaurant is closed on Tuesdays. 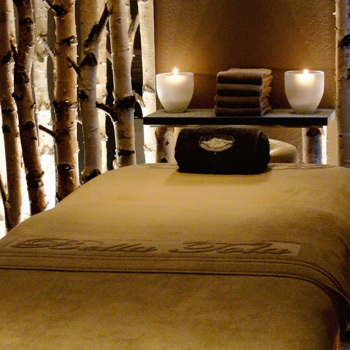 The Hôtel Bella Tola spa is also open to the public in the evening (18:30 – 21:00). Heated pool – 32°C - jacuzzi – sauna – steam bath – ice fountain – relaxation area with a fire-place.